My first ever visit to this Fullers pub on a Wednesday afternoon. The Ship is a pub I have been meaning to tick since 2013 but hadn't got round to it, so after a meeting in the local area it was a good opportunity. A friendly barmaid greets me as I approach the bar. There are 5 hand pumps offering 4 different Fullers ales. These are London Pride, ESB, Seafarers & Chiswick Bitter. The Pride is on 2 pumps. I choose a pint of Chiswick and it’s very good, well kept and refreshing. The pub is more than half full with a mix of locals and workers. There is football and racing on the television screens in the front bar with the back bar area being a little more quiet. I sit at the bar with my pint watching and listening the locals. The Ship appears to be very much a community pub aswell as being a favourable place to watch sport with lots of up coming football and rugby games advertised. 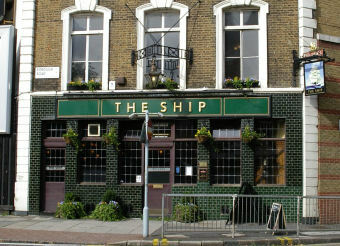 I may return and there’s a few pubs in the area that I haven’t been in so The Ship could be part of a crawl soon. Fullers pub about midway between Borough and Elephant & Castle tube stations. CAMRA seem to rate this pub fairly highly. It's in the current Good Beer Guide and I noticed that they host branch meetings here. It has a nice enough interior with plenty to keep you occupied, including TVs and board games. Lighting is just about right and service was good. Ales are limited to Fullers - Pride, HSB, ESB & Chiswick. But a reasonable pub as Fullers pubs go. Great pub in every way, well run by Mike. I go here quite often. It was refurbished in late 2012. The refurb didn't come a moment too soon becase the men's toilets were foul, there was no lock on the door, the water came out so hot in the basin it was a real health and safety issue. On one occasion I found the toilet seat on the window sill. They're now much improved. The food is patchy. It depends on the chef. I had to send the fish and chips back once. There was virtually no fish. It was dreadful. The food is definitely expensive for the quality. It's as though they've seen what other pubs can charge but forget that if you ask for a premium you do need to deliver something good. The food here is never better than average and it's plain pub fare - nothing gastro. There's almost no healthy option either. The biggest problem is the lack of a decent manager. The guy who runs this place really doesn't seem to care. Some of the bar staff give the impression they really don't care either - although some can be quite friendly. Weekends the crowd here comes to watch sport on the various screens. It's a shame really. This pub coould be good. It doesn't seem to know quite what it wants to be. If it wants to be a decent local then it needs to work on the decent. If it wants to be a destination pub it needs to offer people a reason to go out of their way. If it wants customers it has to care about its customers. If you put a really goood manager in here, one who'd listen and think for a while and then give his or her customers what they want it could be a little gem. I've been here a good few times now because my friend's a bit of a bar spider/regular in this public house. Being next door to quite a built up area it has a well-established local clientele but also pulls in other passing trade. The large windows make it nice and airy and it's cool in summer and inside it boasts panelled walls and pleasant nautical decor. I tend to have the Staropromen which is offered on draught and it's a nice drop. Both the mens' and ladies' toilets are clean, which is always nice. Outside there's a pleasant outside seating area with a patio heater. I think it had pretentions for becoming a gastropub at some point (although a menu did spell mussels as 'muscles') but luckily it's abandoned such dreams and the food's not exactly cheap but is hot and plentiful. I went there one Saturday afternoon and sport was on - not being a huge fan of such things I did find it annoying that it was being shown from both ends of the pub which kind of ruins your conversation really. However once the main match finished it became lovely and quiet.